NAHICHEVAN (1965) The Russian trawler Nahichevan was lost January 20, 1965 between the Pribilof Islands and Saint Matthew Island, approximately 80 miles northwest of Saint Paul Island. Fourteen crewmembers perished in the disaster. The Russian trawlers Sebezh and the Sevsk were also lost with the same number of crewmembers on each. Two of the three trawlers sank and a third was found overturned with one crewmember clinging to the hull. The three vessels had been fishing herring south of the pack ice and delivering to the 532 foot Russian factory ship Pavel Postyshev. NAPOLEON III (1858) The 707 ton French ship Napoleon III was stove in by ice and lost near Saint Paul Island May 20, 1858. 16 souls perished with the Napoleon III. She was on a whaling voyage out of LaHavre, France and had a cargo of whale oil and bone when the disaster occurred. NENOHI (1942) The 1,600 ton 359 foot Japanese destroyer Nenohi was sunk by the U S submarine Triton (SS-201) July 5, 1942 off of Cape Sabak on the southeast tip of Agattu Island. 200 crewmembers of the Nenohi were lost. 36 survivors were picked up by the Inazuma. NEPTUNE I (2012) The 50 foot steel fishing vessel Neptune I experienced engine trouble, grounded and was lost on northwest Umnak Island February 26, 2012. All three persons aboard swam to shore in survival suits carrying the vessels EPIRB and a portable VHF radio. They established communications with the Alaskan Enterprise and were soon rescued by a U S Coast Guard helicopter that transported them to Dutch Harbor. NETTIE H (1993) The 58 foot crab fishing vessel Nettie H disappeared with all hands September 17, 1993 somewhere between False Pass and Saint Paul Island. The five crewmembers lost with the Nettie H were Blake Grimstein of Bellingham WA, Julie Mereness of Colorado, Peter and David Soileau of Cottage Grove OR and Daniel Soileau of Conyers GA. The life raft of the Nettie H was found in the Bering Sea May 11, 1994 with the body of Julie Mereness tied inside. No other sign of the vessel was found. THOMAS Z. FAIRCHILD, second officer, Raymond, Wash.
WILLIAM R. ROBERTSON, radio operator, Redondo Beach, Cal. ROBERT E. LONG, boatswain, Harrisburg, Pa.
RALPH ELLIOTT, able seaman, Nasel, Wash.
B.M. SETTEM, chief engineer, Astoria, Or. JAMES A. NEILAN, Kentfield, Cal. ALFRED BENTHAM, third assistant, Hingham Center, Mass. BRADFORD CHALLENGER, oiler, National City, Cal. HENRY KOPSKE, fireman, Kansas City, Mo. WALTER RAYMOND, fireman, Kentfield, Cal. ARTHUR WHITTAKER, wiper, Passay Rizal, P.I. ZEE AH WU, mess boy, Shanghai. The Nevada and her cargo were total losses. Conditions at the time of the disaster were reported to be ESE 8, High seas and dark. The value of the cargo was unknown, but the Nevada was valued at $255,000. NEW BEDFORD (1851) The 351 ton whaling ship New Bedford ran aground and became a total loss near Umnak Island May 17, 1851. Four crewmen were lost in the disaster. The New Bedford departed New Bedford, MA October 10, 1850 on a whaling voyage. NICHIRYO MARU (1942) The 2,700 ton Japanese cargo vessel Nichiryo Maru was sunk by U S aircraft August 30, 1942 approximately 140 miles west northwest of Attu Island. NISSAN MARU (1942) The 6,537 ton Japanese fleet tanker Nissan Maru was hit by a United States bombing raid, burned and sank in 100 feet of water June 19, 1942 in Kiska Harbor. The raid was carried out by 3 B-17’s, 4 B-24’s and an LB-30. NISSEI MARU (1971) The 90 ton Japanese fishing vessel Nissei Maru capsized and sank March 8, 1971 north of Unalaska with 18 crewmembers aboard. Eight of the crewmembers were rescued by other vessels in the fleet of 18 ships. Ten crewmembers were lost with the Nissei Maru. NO 6 (1898) Barge No 6 foundered near Dutch Harbor July 27, 1898. The barge was valued at $4,000 with cargo at the time of the disaster. The No 6 became a total loss. NO 8 (1898) Barge No 8 foundered near Dutch Harbor July 28, 1898. The barge was valued at $4,000 with cargo at the time of the disaster. The No 8 became a total loss. NORDIC PRIDE (1985) The fishing vessel Nordic Pride sank March 26, 1985 just west of the Pribilof Islands. All five crewmembers were rescued by the fishing vessel Starlite. NORMAR II (1986) The diesel powered steel fishing vessel Normar II swamped and capsized September 11, 1986 approximately 120 miles northeast of Saint Paul Island in the Bering Sea. Four crewmen were lost with the vessel including Alex Halsworth, Ken Ridgely, Richard Bennett and Abbey Picket. The U S Coast Guard cutter Boutwell, a helicopter, two C-130s and 38 fishing vessels were involved in the search for survivors but none were found. NORTHERN DAWN (2006) The 50 foot steel crab fishing vessel Northern Dawn disappeared with two crewmen aboard February 23, 2006 in the vicinity of Cape Kovrizhka on the northwest coast of Unalaska Island. The vessel had been experiencing difficulty with her crab tank pumps while recovering crab pots. The vessels EPIRB, a life ring and an oil slick were all that were found. Lost with the Northern Dawn were Scott Trible (35) of Anchorage and Frank Richard (43) of Federal Way WA. NORTHERN LADY (1995) The 98 foot steel crab fishing vessel Northern Lady caught fire and sank February 13, 1995 in the Bering Sea northwest of Saint Paul Island. The fire started in a stateroom of the forepeak in the vicinity of a portable electric heater and clothing. It quickly spread to the wheelhouse. Efforts to extinguish the blaze were hampered by thick smoke and soon failed. After broadcasting a distress message, the six crewmembers donned survival suits and abandoned ship to a life raft. They were rescued by the fishing vessel North American and transferred to the processing ship Yardarm Knot who transported them to Dutch Harbor. The U S Coast Guard cutter Sherman responded to the scene, determined the Northern Lady to be a hazard to navigation and scuttled her after the Northern Lady owners abandoned and released interest in the vessel. NORTHWEST MARINER (1995) The 93 foot crab fishing vessel Northwest Mariner capsized and was lost with all hands January 15, 1995 off of Saint Paul Island in the Bering Sea. It was the first day of Opilio crab season. The Northwest Mariner had a tank inspection at St. Paul January 14, 1995 and was carrying 130 crab pots on deck. She departed St. Paul at approximately 15:00 the same day for the crab grounds. The following day, January 15 a brief May-Day was broadcast at 14:15 with a location approximately 140 nautical miles northwest of Saint Paul Island. No vessel name was given. U S Coast Guard assets, an Alaska Department of Fish and Game aircraft and fishing vessels in the area responded. At 15:51 an Alaska State Trooper aircraft spotted an overturned hull and identified it as the Northwest Mariner. At 17:45 two unconscious crewmen were found in one of the vessel’s life rafts by the Alaska Trojan. Dry clothing, blankets and CPR were administered by the crew of the Alaska Trojan but efforts to revive the unconscious crewmen of the Northwest Mariner failed. They had not had time put on survival gear as the Northwest Mariner capsized in the icy 20 foot seas. A second empty liferaft was found by the Pacific Mariner. Weather at the time of the disaster included winds of 50 plus knots out of the NNE, seas to 25 feet and a temperature of 25 degrees. There were six crewmembers from Washington State lost with the Northwest Mariner including Jim C Foster (37) of Seattle, Larry Johnston (36) of Bellevue, Bruce K Forde (38) of Edmonds, Rob Olsen (26) of Seattle, Bob Peterson (35) of Seattle and Troy Collins (30) of Everett. NORTHWESTERN (1942) The 336 foot steamer/civilian barracks ship Northwestern was struck by a Japanese carrier aircraft attack, caught fire and was heavily damaged June 4, 1942 at Dutch Harbor. 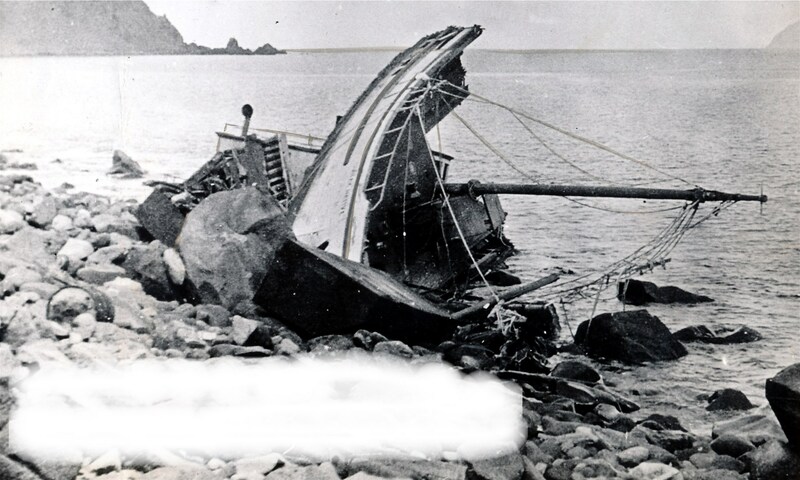 After the war the vessel was towed to the head of Captains Bay and sunk. It is now a National Historic Site. The Northwestern was an iron and steel ship built in 1889 in Chester, Pennsylvania as the Orizaba. Her first sailings were out of New York for Cuba. After several years the Orizaba was brought around the Horn to Alaska as a freight and passenger steamer for the Alaska Steamship Company. She was rechristened and renamed the Northwestern around 1906. She operated for more than 25 years in the Alaska trade retiring in 1938. The Northwestern had the infamous reputation of having struck every reef on the inside passage. In 1940 she was refurbished and brought to Dutch Harbor. NOZIMA MARU (1942) The 449 foot Japanese freight and troop transport ship Nozima (Nojima) Maru was sunk by a raid by USAAF aircraft September 14-15, 1942 in Kiska Harbor. In October and November of 1956 the stern portion of the Nozima Maru was refloated by the vessel Salvage Chief and taken in tow by the tug Sudbury for delivery to Japan but capsized and sank a day short of her destination. The bow section of the Nozima Maru remains at Trout Lagoon in Kiska Harbor. NUMBER TWO (1942) The 74 ton 70 foot wooden scow Number Two was sunk by enemy action March 13, 1942 near Dutch Harbor. NUMBER FOUR (1942) The 74 ton 70 foot wooden scow Number Four was sunk by enemy action March 13, 1942 in the vicinity of Dutch Harbor.